Pas with FQDN: has been detected to be down. I had a customer log a support case detailing an issue whereby all Lync 2010 clients were displaying a red banner stating “Limited functionality is available due to an outage”, however this customer had only a single front end server. 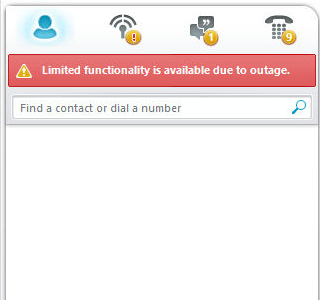 This message is typically displayed when users registered against and SBA experience a WAN outage in their location which results in them being unable to contact the associated front end server. The message shown in the client is illustrated below. Pas with FQDN: lync.domain.co.uk has been detected to be down. The above error essentially caused the underlying message that was displayed in the Lync client and in order resolve the problem the virtual machine was moved to another virtualisation host which immediately caused the error in the client to disappear as reliable access to the storage volume was now possible.